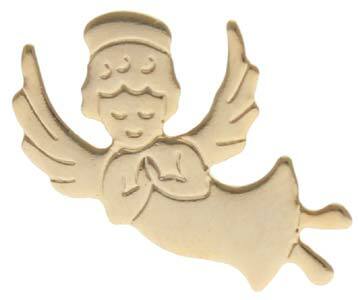 Gold happy flying nurse or caregiver angel pin with praying hands. Flat Gold Plated 5/8 inches. Attach to packages, Guardian angle pins. Give to angels of mercy. Inspirational angel pin. Each pin comes with a clutch back and is individually poly bagged. As low as $1.69 in bulk.